Guest post written by Maria Fyodorova of Righteous (re)Style. Kristen Swenson is not your average sewing lass. 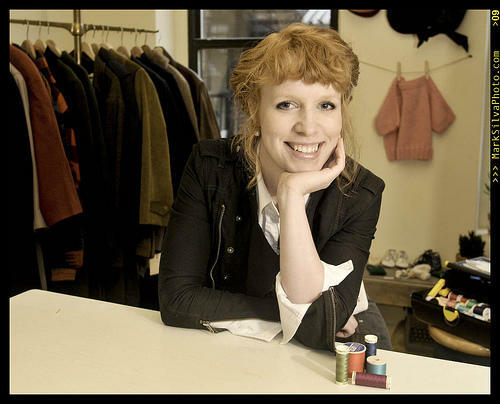 She’s an aspiring fashion designer committed to embracing sustainability. As the in-house seamstress at Treasury, a 14th Street boutique that offers a tightly-edited collection of vintage finds, Swensen can help you turn that almost-perfect vintage dress into your best-fitting outfit ever. Originally from a small town in Minnesota, Kristen recently moved to DC and hopes to launch her clothing line soon. Here’s what she had to say about her eco-friendly approach to fashion. Can you tell us a bit about your approach to sustainable fashion design? I prefer to pair design and recycling whenever possible. It’s the only way I can be in the fashion field with a clean conscience. Typically I will take damaged or second-hand items and completely revamp them so they can have another life before they find the landfills. Why did you choose to work at Treasury? What do you like about vintage clothing? The shop is beautifully organized–more like a boutique–which really showcases the items. One of the owners, Cathy, was so nice and welcoming to me, it was hard not to fall in love with Treasury. In addition, they would eventually like to sell my designs [there]. As for why I love vintage so much, simply put, it is the most glamorous form of recycling. I know you plan to start selling your designs soon, can you give a bit of preview of what kind of designs we’ll see (i.e., materials, fabrics, silhouettes)? It’s hard to give an official preview because what I will be making will depend on what second-hand items I find. In general, I aim to showcase the beauty of the female figure, and show an appreciation for curves. One can definitely expect to find well-tailored garments with a lot of details, made from beautiful and unique fabrics. You’re wearing a bustier that you designed — can you tell me a bit about it? Where did it come from? The outside is made from second-hand men’s suiting fabric, the lining out of an old bed sheet, and the underlining out of jeans I outgrew. Because the jean material is so sturdy, it reduced the amount of boning that was necessary for the garment. In addition, the cotton lining and cotton underlining allow the skin to breathe, even if the garment is tight. Treasury is co-owned by Cathy Chung and Katerina Herodotou. Their carefully handpicked vintage clothing is displayed artfully on salvaged fixtures from Community Forklift and Rough and Ready. Check out this lovely shop located at 1843 14th St., 2nd floor.